The smallest patch clamp system available. Record a single channel at up to 20kHz sampling rate in a pocket sized lightweight design. It can even be mounted straight on to a manipulator! Tecella has released the Pico, a full-featured, low-noise patch clamp amplifier with an integrated digitizer and headstage. 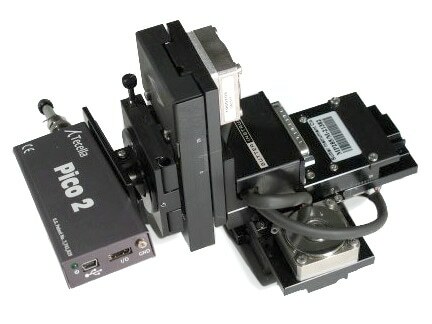 Pico is ideally suited for whole cell (Vclamp and Iclamp) and single-channel (patch, planar lipid bilayer, and synthetic nanopore) recording, as well as cellular electrochemistry. 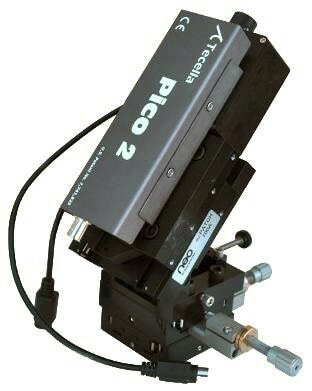 Pico measures just 5.6″ x 2.5″ x 0.7″ (14.2cm x 6.3cm x 1.8cm) and consumes less than 1 watt of power. Pico’s standard compensation circuits include series resistance, fast capacitance, three slow capacitances, and junction potential offset. The patented spread frequency compensation can automatically compensate any arbitrary capacitance profile in approximately 3 seconds. Voltage Clamp, current clamp, digitizer, and headstage all-in-one. Five feedback gain resistors to cover whole cell, single channel (patch, planar lipid bilayer, and synthetic nanopore), and cellular electrochemistry. Pico measures just 5.8 in x 1.8 in x 0.7 in (14.5 cm x 4.6 cm x 1.7 cm) and consumes less than 1 watt of power. Common driver for all models.